Skillfully updated for a new generation of seekers of ancient Chinese wisdom, this fortieth anniversary edition showcases Theodora Lau’s poetic elegance together with her daughter Laura Lau’s fresh, contemporary perspective on Chinese horoscopes. Do you know which of the twelve animal signs you are? How does the “animal that hides in your heart” influence your outlook on life and your relationships with others? What happens in your chart when your Eastern moon sign meets your Western sun sign? 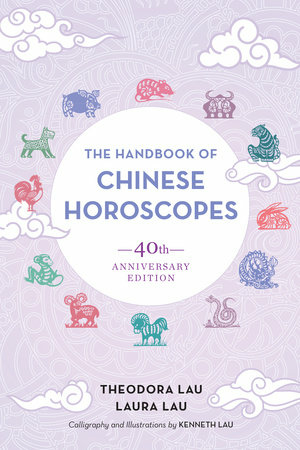 For forty years, The Handbook of Chinese Horoscopes has remained the classic book on the topic, artfully combining the Eastern lunar calendar with Western solar-based astrology. You’ll discover how the five elements, four seasons, and the ascendant sign based on the hour of your birth can all affect your personality. Look to the future and see how you are likely to fare in the upcoming years. Read about the 144 marriage combinations to better understand the relationships between the twelve lunar signs. Featuring all-new lunar forecasts, this revised edition will delight seasoned astrologers and interested novices alike, just as the classic work as done for decades. THEODORA LAU has authored The Handbook of Chinese Horoscopes, Best-Loved Chinese Proverbs, The Chinese Horoscopes Guide to Relationships, and Chinese Horoscopes for Your Child. First published in 1979, Theodora's book The Handbook of Chinese Horoscopes has been translated into over 17 languages and her books have introduced many topics of Chinese culture to readers all over the world. She was born in Shanghai and later moved to southern California with her husband, Kenneth Lau, whose calligraphy and woodcut illustrations adorn the pages of the book. LAURA LAU, Theodora Lau's daughter, lives in Los Angeles.